But that’s not all Gemma is trying to hide. As the investigation digs deeper into the victim’s past, other secrets threaten to come to light, secrets that were supposed to remain buried. 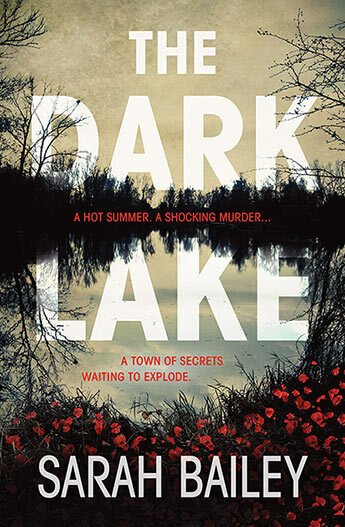 The lake holds the key to solving the murder, but it also has the power to drag Gemma down into its dark depths. This debut novel from Melbourne-based author Sarah Bailey is a psychological thriller (mostly) narrated by Gemma Woodstock who was at high school with the murder victim, Rosalind Ryan, over a decade before. Gemma conceals some things she knows about the victim which risks compromising her official role. Their previous relationship was complex and relevant to the resolution of the murder and the story is presented through an alternating timeline of the past and the present. For Australian readers, the setting is convincing. It is Christmas time in the middle of an exhausting hot summer in a small country town, Smithson, where everybody tends to know everyone else’s business – past and present. The characters are interesting although not necessarily appealing. The murder victim, enigmatic, beautiful and young, has returned to Smithson to teach at the high school. Everyone ‘knew’ her but it becomes clear that they did not know her at all well and mystery surrounds her relationships with others, including Gemma Woodstock. Gemma herself is a flawed and complex character, quite apart from her past relationship with Rosalind Ryan. I must say that I did not like Gemma. Her personal life is a mess. She is rather self-obsessed, she is cheating on her partner (the father of their child) by having an affair with a fellow (married) police officer and some of her actions are very off-putting. However, she is a dedicated detective and as secrets from the past are revealed their impact on the present day actions of the characters becomes clear and lead the way to resolving the murder. The long-lasting impact of passion and jealousy among teenagers, as well as the tragic outcomes of misguided actions are laid bare. The novel should have been edited to tidy up quite a few loose ends but the author shows promise. She is working on a sequel at the moment and she will have learnt a great deal from the process of writing this book.